The name Las Vegas Elite Runners and the team colors black and white was discussed and agreed upon by the original athletes in 2001. The Las Vegas Elite Runners was comprised of a group of friends who had been competing against one another individually for years on the USATF Junior Olympic circuit and high school level. Although the boys had previously discussed the idea of getting together and forming a team, that idea became a priority after the 2000 USATF Cross Country Regional Meet. Competing individually in the Youth Division, only 3 boys from Las Vegas placed among the top 20 finishers and qualified for the National Championships. It was easy to see at that time that each runner would have qualified for Nationals if they competed as a team and finished among the top 3 teams. 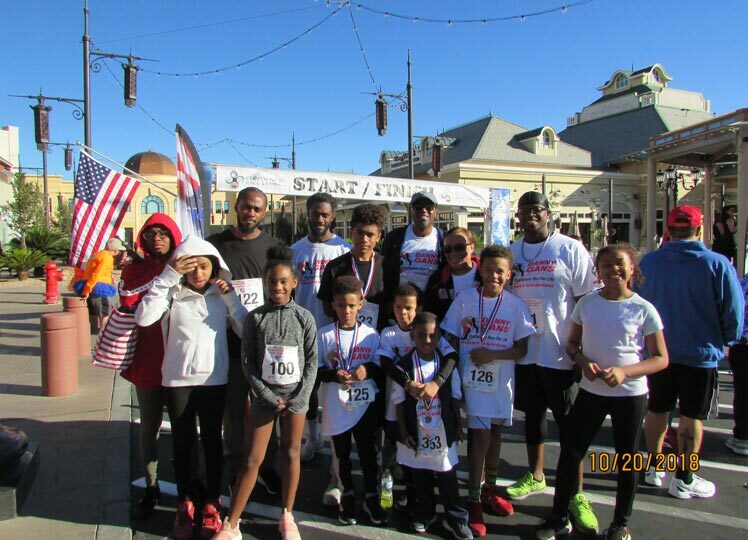 So, with the team’s president and founder, Naomi Davis along with the help and guidance of parents and friends, the idea of the Las Vegas Elite Runners became a reality. The formation of this team provided an opportunity for Southern Nevada runners to continue competing past the high school season and to experience competition at higher levels; such as competing in the USATF Junior Olympics Cross Country Championship and the Footlocker West Regionals at the famous Mt. SAC cross country course in Walnut, California. The recently-formed Las Vegas Elite Runners Cross Country Team swarmed to a first place finish at the USATF Region 15 Junior Olympics Cross Country Championships at Vista, California on November 18, 2001. The Team’s first 5 runners placed in the top 15 to narrowly defeat the Equalizers of Southern California 32-40 and win the Intermediate Boys Division (15-16 year olds) Team Championship. The victory qualifies the Elite Runners to advance to the USATF National Cross Country Championships to be held in Lincoln, Nebraska on Saturday, December 8, 2001. Different teams set different goals entering a season or a competition, but there seems to be one universal goal among cross country teams that is often discussed but very rarely accomplished. That is, to have each of its members run their best times in the most important meets. The Elite Runners accomplished that goal at this meet as each of its 8 runners recorded 3-mile personal best times on the runner-friendly, mostly rolling cross country course at Buena Vista Park. Chaparral High School’s Patrick Swick finished in 15:15 to earn the individual championship in a race where the boys maintained a fast and furious pace from start to finish. The lead changed hands several times in the early going, but Patrick put on a sudden surge just after the first mile at the crest of the course’s only major hill and exploded down the backside to gain a comfortable 30 meter lead that he never relinquished. Matthew Yadegar of Cimarron-Memorial, along with Stepfon Davis and DeVon Davis of Cheyenne worked beautifully together as a team, exchanging places and encouraging each other to maintain the pace. As a result, they steadily pushed and pulled each other closer to the front as the race went on. Matthew finished in 6th place with a time of 15:55; Stepfon finished in 8th place in 16:05; and DeVon finished in 9th place in 16:14. Galen Smith of Chaparral was the team’s final scorer, placing 15th in 16:23. Galen started slow, but managed to weave his way through those runners who may have over-extended themselves in their efforts to keep up with the incredible pace set by the front runners. Galen was closely followed by teammates Ray Rodriguez of Vo Tech, 18th in 16:35; Agustin Luna of Chaparral, 19th in 16:41; and Chris Hoppie of Eldorado, 24th in 17:01. The Las Vegas Elite Runners Logo was designed to embrace the hopes and dreams of five young athletes – that eight friends and competitors from different track clubs and high schools could come together as a team to achieve something special that could be treasured for a life time. Special thanks to all who made this team a reality. It is our hope, that for years, it stands as a testament of the dreams of these young athletes and our and our commitment to them.